A world-class, world renowned medical center, University Hospital Sharjah is functioning with 325 beds spread across multiple specialties including 210 in-patient beds, 40 specialty outpatient beds, 34 emergency beds, 11 ICU beds, 10 CCU beds, 11 neonatal ICU and 9 daycare beds. 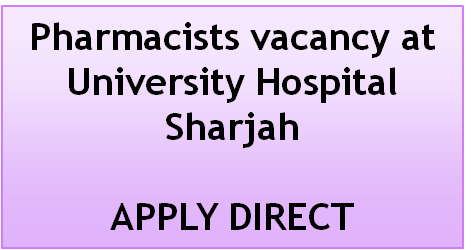 This amazing organization is now having a vacancy of Pharmacists. The details are provided here below. Please note that we are informing our fellow pharmacists through this post. You may please apply direct to the job provider by clicking here. Also provided details that we found in the website of this great organization, for your information. Liaises with Internal: Physicians, nurses, and other health care providers. External: Sharjah University staff, agencies, organizers, and others. Pharmacists provide pharmaceutical care by monitoring drug therapies, reviewing medication orders, providing drug information and dispensing appropriate medication to all patients. Consistently complies with UHS policies, procedures and practices. Completes and maintains all regulatory requirements including: licensure and certification and other mandatory training within established time frames. Reviews medications orders and patient medication profiles for appropriateness of therapy. Monitors for drug interactions, duplication of therapy, allergies, adverse reactions, appropriate formulary alternatives and identifies medications. Maintains proper documentation on patient profiles or prescriptions. Identifies and capable of using resources to ensure safe medication practices. Responds to incidences, adverse drug reactions, medication errors, and reports appropriately. Checks all prescriptions/physicians orders for accuracy before dispensing. Checks unit dose, ward-stocks, pharmacy trays prepared by pharmacy support staff. Counsels patients/nurses with clear and accurate instructions (either by verbal counselling, written labels). Calculates and confirms pharmaceutical dosage calculations (paediatric doses, IV admixtures, chemotherapy, etc.). Performs patient care areas/clinic ward-stock inspections. Able to work at an acceptable work pace and able to direct and keep work flowing. Completes tasks efficiently and in a timely manner. Practices accountability and follow up with fellow workers. Facilitates communication by answering telephones, taking messages, forwarding information. Oversees the daily activities associated with medication dispensing and preparation. Completes key jobs and responsibilities as required by the senior pharmacist. Maintains professional knowledge by attending lectures, seminars or on-line education units. Shares drug information accurately with physicians and other health care workers. Responds to physician, health care workers and patient drug related questions appropriately. Participates in pharmacy programs and staff meetings. Shares information appropriately with pharmacy team. Accepts and adjusts to changes in departmental procedures. Exercises punctuality and is respectful of break times. Communicates appropriately to all clients (example: telephone etiquette, customer service). Education: BSc degree in pharmacy from an accredited college of Pharmacy (minimum). Experience: NLT 2 years' experience as a hospital pharmacist in a short- term acute care hospital. Outpatient Pharmacist - NLT 2 years of pharmacy practice experience, preferably in a hospital pharmacy. Experience as a sales representative or in a drug store is not acceptable. Currently licensed as a Pharmacist with a Professional Organization in country of origin. UAE Ministry of Health License (required no later than within initial three months of employment). Familiarity with hospital pharmacy functioning. Good knowledge of physiology, pharmacology and pharmaceutical. Familiarity with locally available drugs and pharmaceutical, and their indications. Ability to communicate with medical professionals. Must have basic computer skills, ability to communicate clearly, knowledge in drug information and research. Ability to provide direction for pharmacy support staff. Ability to use a computer for 6-9 hours a day. Able to stand up for long hours to facilitate medication checking or dispensing to patients. To work all shifts as required. Please find the link provided in the first part of this post and directly apply.